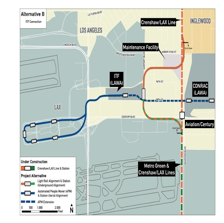 ALPERN AT LARGE-As stated in my last CityWatch article on the subject, the recently-proposed Intermodal Transportation Facility (ITF) option, along with other options to connect our growing MetroRail system to LAX, has a few "C's". Let's add two more: Connectivity and Cost-Effectiveness. These two "C's" are in addition to the "C's" already addressed in my past article: Completion, Conundrum, Collegiality, Capital, Commerce, and Credibility. Having immersed myself in this complicated issue for over a decade, I can tell you that it's hard to just throw together and summarize to make it easy for anyone to just figure it all out in a few minutes. 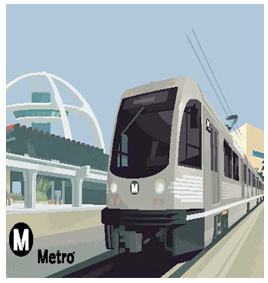 In my years as co-chair of Friends of the Green Line [[www.fogl.us]], I've found that a picture is worth a thousand words--so "say hello" to the ITF option now being promoted by CD11 Councilmember and Metro Boardmember Mike Bonin, as well as by LAWA. The ITF option "splits the difference" between a currently-approved Metro Crenshaw/LAX Line that goes too far to the east versus a westward deviation of the Crenshaw/LAX Line that would dive under LAX and create an upside down fork (the proper term in the lingo of the transit world is "wye", based on the configuration of the letter "Y") south of the airport to proceed to the two ends of the Green Line (South Bay and Norwalk). After years of presuming and promoting a Century/Aviation station/connection of a People Mover to the Crenshaw/LAX Line (Century/Aviation will ALWAYS be critical because of its future location of the Consolidated Rental Car Facility, or CONRAC), I briefly favored Metro's under-LAX route because of its simplicity for Metro operations and because it's the "direct/LAX connection" commuters have always pined for. Unfortunately, issues of cost (it'll be about $1-2 billion more, potentially, than other proposed alternatives), operational questions, getting the all-powerful Federal Aviation Administration (FAA) to go along with tunneling under the airport, decreased frequency and passenger capacity compared to a People Mover--and especially the all-critical issue of the local map of the region--all argue against this otherwise-venerable Metro proposal. A connecting LAX People Mover to an ITF station (where, ideally, Metro passengers would have a quick and easy transfer) has the benefit of trains every 2-5 minutes (at best, Metro trains would run every 5-10 minutes), and would also be able to collect passengers from stations along the Century Blvd. commercial corridor, from the hotels to the CONRAC to potentially as far east as the redeveloping portions of Inglewood (like the Forum). Furthermore, cars, vans, trains and buses would have adjacent and facilitated access to provide quick an easy dropoff access to LAX via the ITF (imagine not having to go all the way into the central loop of LAX to drop someone off, or pick someone up, to or from their airline trip). Concerns have also been expressed about the configuration of the Century/Aviation station (already planned and configured by Metro planners) with the CONRAC and People Mover (still being planned and configured by LAWA and the car rental companies, who are about 1-2 years behind Metro in their legal and planning efforts), so that any People Mover east of the ITF is still too nebulous to proceed at this immediate time. Yet another bonus is the route of the People Mover along 98th Street that would create more than an enhanced Century Blvd. commercial corridor--it would create a huge business district of retail and outlet stores north of Century Blvd. that could stretch as far west as the LAX terminals themselves to as far east as Inglewood...but, as aforementioned, that's still nebulous despite enormous commercial potential. Commercial potential, however, that could, in theory, create a huge profit/jobs center for Los Angeles that rivals anything we see Downtown and along Wilshire Boulevard. So the two "C's" of Connectivity and Cost-Effectiveness are indeed pointing towards the ITF/People Mover proposal being pushed and promoted by Mike Bonin and LAWA--with kudos, not blame, for Metro in leading the way on any future LAX/MetroRail connection, and to LAWA for stepping up to create added bonuses to this connection that could spell enormous commercial and operational improvements to the region. And with the concept of Cost-Effectiveness in mind, it should be noted that there will be no residential developments affected--all residential parcels are being bought up by LAWA, so we need not impact homeowners or apartment renters and their families. The redevelopment agencies and accompanying residential developer inside connections (many of us call it "corruption") that we have seen, and might yet again see, at the so-called Great Park in Irvine (you know, that farce of an open space left by a NIMBY Orange County when El Toro Air Force Base shut down where and when a new airport should have been built ... won't happen near LAX. This region will be entirely commercially-zoned...period. LAWA has made that abundantly clear for years. What we DO have to be on our guard against, as with all major transportation/infrastructure projects, is that we don't have subpar contractors with sordid histories, such as Ron Tutor (he of the Tutor-Saliba and Tutor-Perini fiascoes, ranging from the Metro Red Line Subway and Van Nuys Flyaway projects, and potentially of the California High-Speed Rail Project) anywhere near this vital MetroRail/LAX connection. The recent flaws in the southern LAX runways performed by Tutor-Saliba and other contractors call to mind the need to be ever-vigilant of contractors, no matter how politically-connected they might be, who are paid hundreds of millions of dollars for critical public works projects that must be built right the first time. 1) Gina Marie Lindsey, Executive Director of LAWA, in response to my query about who would pay for this ITF Proposal, announced she would not, and could not, legally give a blank check to Metro (which is only fair and logical), but did announce that LAWA would pay for the underground Crenshaw/LAX Light Rail station at the ITF. 2) Everyone is making it clear that the People Mover would not be a second-rate bus system but rather a first-rate rail system, able to operate 24-7 and probably automated. Presumably this would be funded predominantly by LAWA. Legally, LAWA can only pay for only one station outside of LAX-owned property, so the Cities of L.A. and Inglewood, as well as the airport-adjacent hotels, would have to pony up funds for more stations. 3) Roderick Diaz of Metro announced that no matter which of the three linkages between LAX and the Crenshaw/LAX Line, there WILL be a future north-south Westside line (either up Lincoln or Sepulveda Blvds.) that will operationally be part of the Green Line to Norwalk, as well as another line created by the Crenshaw Line that will be linked to the South Bay Green Line. Connectivity and Cost-Effectiveness...two more "C's" for us to focus on, and benefit from, the long-awaited and decades-overdue rail/airport connection needed to lead LA City and County into a first-rate, 21st Century economic power. How can America pay for its roads? Will the U.S. Ever Get High-Speed Rail Anywhere?